Every day, people in the United States are being injured and killed by vaccines. This is a fact that is not in dispute, as the Department of Justice's quarterly report on vaccine injuries and deaths clearly demonstrates. And yet, the government's official public statement about vaccines is that they are safe and effective, and should be mandated for all people. Any opinion or presentation of facts to contradict their position is vigorously suppressed and censored all in the name of "public health" for the "greater good." The American public is largely unaware that there is a vaccine court known as the National Vaccine Injury Compensation Program (NVICP). This program was started as a result of a law passed in 1986 that gave pharmaceutical companies total legal immunity from being sued due to injuries and deaths resulting from vaccines. If you or a family member is injured or dies from vaccines, you must now sue the Federal Government in this special vaccine court. Many cases are litigated for years before a settlement is reached. Once every 3 months the Advisory Commission on Childhood Vaccines meets, and the Department of Justice issues a report of cases settled for vaccine injuries and deaths. As far as I know, Health Impact News is the only media source that publishes these reports each quarter. The most recent report is from March 3, 2016. Every quarter for the past couple of years, it has been increasingly difficult for Health Impact News to obtain this report, which used to be routinely published on the Health Resources and Services Administration (HSRA) government website. Health Impact News just now received the report from March, and in a couple of weeks the next report will be due at the June meeting. 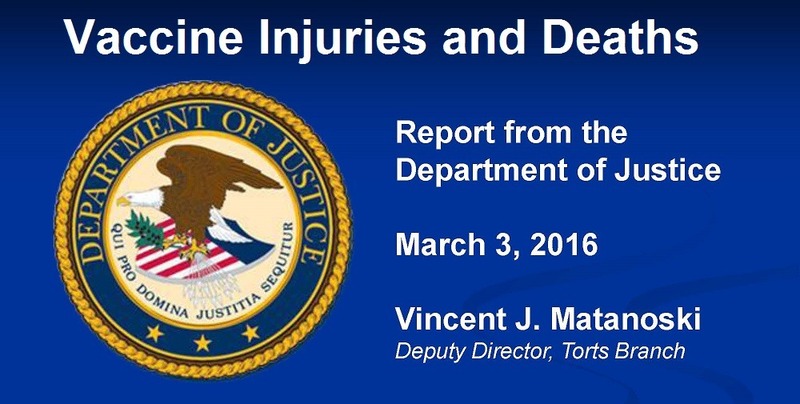 The report for March 3, 2016 which covered the period from 11/16/15 to 2/15/16 had 199 cases adjudicated. 108 of them were listed in the report, specifying the vaccine, the injury or death, and the amount of time the case was pending before settlement. There were three deaths: two related to the flu vaccine, and one related to the TDaP (Tetanus, Diphtheria, Pertussis) combo vaccine. 88 of the 108 cases settled were for injuries and deaths due to the flu vaccine, making the flu vaccine the most dangerous vaccine in the U.S., harming and killing more people than all the other vaccines put together. Here is the report the government would prefer you not see. When considering the value of any medical treatment, it is important to consider the risk:benefit ratio. How many people can we estimate would die every year from complications of influenza if the United States offered no influenza vaccine? We must also remember to think in terms of percentage of people injured by a vaccination, not just a raw number. It is a tragedy that anyone would die as a result of a vaccination. One death is terrible. But, how many people received the influenza vaccine last year? In this article it states that two people died from the influenza vaccine during a 3 month period. But in one week (the week ending January 23rd, 2016) 1,861 people died from pneumonia and Influenza-related mortality! There is simply no question- vaccines are low risk and high benefit. Even with mass vaccination, influenza kills thousands of Americans every year. If you have any question about the benefits of vaccinations, just take a look at morbidity and mortality statistics in the years before vaccinations. The number of people killed or permanently injured from infections that we can now prevent is staggering. Please remember- if we do not learn from history, we are bound to repeat it.